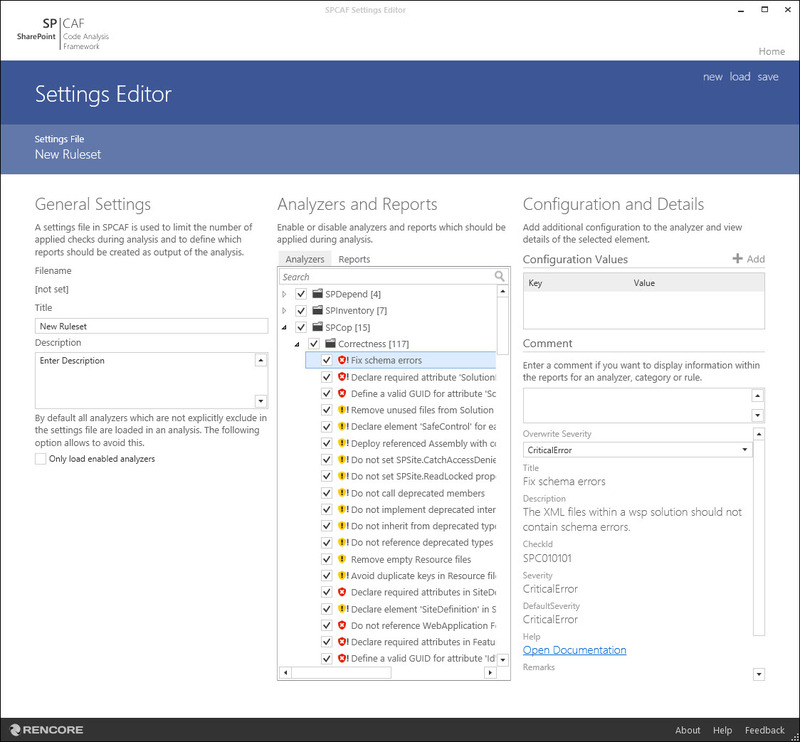 Settings in SPCAF are files with extension '.spruleset', which configure the analysis process, the reports to be created and define, which rules are disabled during analysis. Settings can be used with the commandline parameter 'SettingsFile' to disable rules during analysis. By default SPCAF loads settings from the location '[INSTALLATIONFOLDER]/Rulesets', e.g. 'C:\Program Files (x86)\SPCAF\RuleSets'. spcop.exe -i "D:\SolutionFiles" -r "HTML" -s "RS02_MinimumRecommendedRules"
spcop.exe -i "D:\SolutionFiles" -r "HTML" -s "RS02_MinimumRecommendedRules.spruleset"
spcop.exe -i "D:\SolutionFiles" -r "HTML" -s "C:\Program Files (x86)\SPCAF\RuleSets\RS02_MinimumRecommendedRules.spruleset"
To edit existing settings or to create custom settings the tool 'SPCAF.SettingsEditor.exe' can be used. The tool can be found in the installation directory of SPCAF and is also available in the programs menu. See below a screenshot of the settings editor. NOTE: If you want to include these third party files for a certain rule you can set the configuration value "IgnoredFiles" for this rule in a settings file and the configuration value which is assigned on a higher level will be overriden. Some rules can be configured via configruation values. For instance the rules for integration of FxCop allows you to configure the FxCop settings or configure the path to FxCop installation directory. The configuration is stored as a key value pair within the settings file. All Analyzers All available analyzers are applied during the analysis. Minimum Settings These settings focus on the most critical problems in your code for which Code Analysis is the most accurate. Only analyzers from the categories Correctness, Security and Supportability are applied. Minimum Recommended Settings These settings focus on the most critical problems in your code and violations against best practices. The settings extend the MinimumRules with rules from the categories Design, Best Practices and Deployment. Extended Recommended Settings These settings focus on a detailed check of your code. The settings extends the MinimumRecommendedSettings with checks from the categories Localization and Naming. Migration Assessment Settings These settings only runs analyzers for the Migration Assessment and only creates the assessment report. FTC Mapping Recommendations These settings only runs analyzers for the Migration Assessment and only creates the assessment report.